Knightdale Station is a fantastic place for families to spend a afternoon on the playground or a couple hours walking and getting some fresh air. It also offer an abundance of spots for creating some hometown senior pictures! I met my senior, his dad and sister about 4:30 on a Thursday afternoon. Kaleb is a senior wrestler in high school and, after a little chit chat, I learn he plans to attend school to study Forensic Science with hopes of joining the FBI. 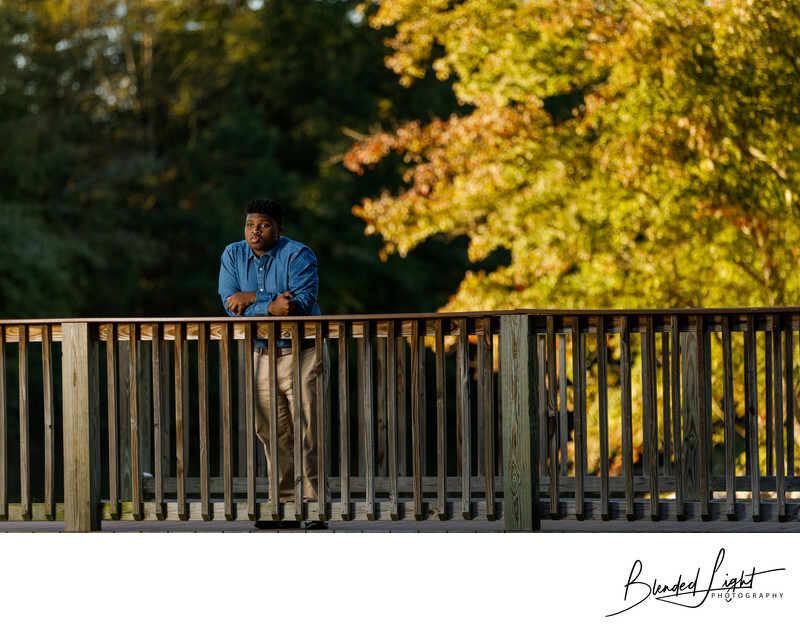 We walked around the park, taking the opportunity to create some other fantastic images in early fall afternoon. As we were wrapping up at one of those locations, I turned and saw the setting sunlight lighting up this tree behind the bridge. I asked Kaleb to walk up to the bridge and just simply lean on it as if he were looking out at the trees behind me and to my left. His sister helped me out with my flash, holding it steady on the sloped hill to my left and just out of frame. After a couple quick adjustments, we had this great and reflective image of my senior. With 76 acres and over 2 miles of walking or running trails, Knightdale Station offers a tremendous value to those in the Knightdale, NC area. Equipped with a large playground, numerous athletic fields and a dog park, the park has a little something to offer anyone. For portraiture work, there's a number of locations fantastic for creating gorgeous images, regardless of whether they are senior or family images. The wooded areas of the park are easily accessible and small openings here and there present opportunity to create forest themed images. The bridge, as seen above, is a great choice for early morning and later afternoon sessions. And with a small pond nearby, this section of the park is full of locations for portraits. Additionally, with the multitude of paved trails throughout the park, many running through areas shaded by the trees in the park, you have a great chance of creating a family image with dark sides and a glowing background. Knightdale Station Park offers immense opportunities for making some fantastic images. I would love help you create these images, so send me a email and let's get you scheduled for a fantastic session of any type! Location: Knightdale Station, Knightdale NC. 1/200; f/2.8; ISO 50; 165.0 mm.